Barnes & Noble is giving $100 gift certificates to Nook e-reader buyers who placed orders for the devices to be delivered before the holidays and now won't receive them until after the Christmas. The company had hoped that most preorders from November would be delivered by December 24, but says that some won't arrive on time. Unveiled in late October, the Barnes & Noble Nook has seen several delays and is already out of stock across the country. The $259 e-book reader is the main competitor to Amazon's Kindle device, and it has received mixed reviews due to several software slowdowns. 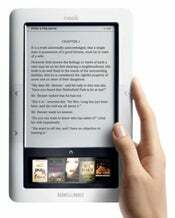 Barnes & Noble said that most customers who pre-ordered the Nook should receive their device in time for Christmas. Otherwise, a $100 gift certificate -- representing more than a third of the value of the Nook -- will come with the late delivery of the e-reader. The company blames the problems on higher than expected demand for the Nook. While dealing with the hardware shortages, B&N has been keeping busy fixing the reported software problems that affected the device in the early models sent to reviewers. Initially, a software update was expected in January 2010, but reports now point to an update as early as this week -- just in time for the first deliveries. Meanwhile, Amazon is boasting record sales for the Kindle in December. In contrast to Barnes & Noble, if you order a Kindle by Tuesday (December 22), you get free two-day shipping, with a guaranteed arrival by Christmas Eve. However, in previous years, Amazon has not been able to meet the demand for the Kindle. In 2007 there were Kindle shortages throughout the holidays, while in 2008 the e-reader was sold out again.